When small hands slowly pull the cardboard lid over themselves, inside the box is where I’d like to be. Inside the box, arms and legs tangle– and what belongs to whom doesn’t matter anymore. Inside the box, a torrent of laughter twists with begging for turns. This is where Negotiation and Joy make love. Inside the box, we draw shades of darkness willingly, forgetting our unhappy freckles, our crooked teeth, our tortured skin tones. Darkness makes us same. Inside the box, we push against boundaries together, exploring the limits of strain nearest breaking point. Inside the box, physical closeness becomes intimacy: familiarity unmentioned but worn like skin. 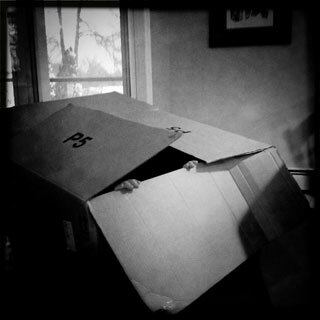 Inside the box, the roaring dragon flees across an unchained mind. Even when seams break, sides collapse, and bodies explode out, the inside prevails. The spirit of the box keeps itself on call, for the next bottomless adventure. At Letters from a Small State and The Least Weird Person I Know, writer Elizabeth Howard examines how we survive and occasionally thrive in America, through the lens of our smallest details. A writer and poet living in Connecticut with her new family, she works daily in her own slivers of creative space and time. That’s a brilliant way of looking at things. I always enjoyed playing in the box when I was a kid…. thanks Mark. Thinking out of the box by thinking in the box! haha! Beautiful, powerful imagery E! You can smell the cardboard and the heat of children breathing in this one.